On Saturday, hubby and I worked hard to complete my boys’ bedroom. Fortunately for me, hubby changed his mind and decided to help me after all. Armed with a hacksaw, drill, and gutters, we (okay….he) went to work. I’m thrilled with the end result. 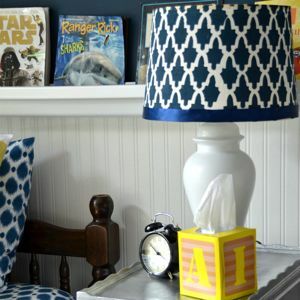 Wainscot wallpaper, restyled barn stars, transformed nightstand, men’s shirt lampshade, and finally rain gutter bookshelves have all come together to complete the look. (Wow, I was able to squeeze a ton of posts out of this one project!) I originally had the beds bunked which was cute, but with my 21/2 year old finally out of his crib, I wasn’t quite comfortable with my boys’ in bunk beds. They are incredibly clumsy and accident-prone. We didn’t have a bunch of money to spare, so this was by far the cheapest option of making a functional and cozy space for our kiddos. This picture was taken moments after the Big Reveal. I think I can count it a success! They love their new look and the easy access it affords to their books. The beadboard wallpaper was easy to hang, looks phenomenal, and costs a fraction of the price of the real stuff. The only drawback is durability. I’m not at all confident it’s going to be able to hold up to two little boys. It is made out of some type of foam and nicks rather easily. Hubby nicked it in a few places while hanging the rain gutters. Ah well, time will tell. The rain gutters cost $5 a piece and this project took two. You have to watch the cost of brackets, joints, end caps, etc. because, as my Grandpa used to say, “That’s how they get ‘cha.” We used as few of these items as possible and opted to just drill through the plastic in several places and miter the corners ourselves. Just in case you’re curious as to what the other side of the room looks like, here are a few more shots. I know. Don’t hate me. We have exposed brick in nearly every room in our house. I love it too! Thanks for looking. If you like what you see, consider officially following me! Also, please leave a comment. I love them! WOW! Rain gutters…who’d a thought they’d make such awesome bookshelves? Hi Beth — it’s several years later now — how did that wallpaper hold up in your boys room ? You did a great job and I love the rain cutter book shelves… Just looking at putting the wallpaper in a hallway with lots of traffic (and occasionally up to 8 grandchildren… ) Thanks for any feedback you can provide ! It’s still going strong and looks great! I’ve repainted it just to spruce it up since it was painted with a duller white originally. I would be hesitant to put it in a hallway though. It is foamy and will nick and ding if bumped into with objects. I came to your site because I’m researching beadboard wallpaper. Needless to say, I l.o.v.e. what you’ve done with the beadboard wallpaper, but I’ve never seen anyone use rain gutters as book shelves. Brilliant. I’m glad I stumbled upon your beautiful blog. I’m leaving here to check out your Pinterest and I’m confident, I’ll be back to your website. You guys did a fabulous job! I am in love with the gutter shelf…I just might have to take that idea and copy it. Thanks! I love the use of the gutters. I only wish that I would have known about this when my girls were little. I have tried to think what it would look like in my masterbed room turned office. Lovely, I know the boys must be pleased to spend time in their own rooms. And I really like the way you used the beds as single, instead of bunk. This way when they go to bed they can see each other when they talk. How cozy. I LOVE, LOVE, LOVE it!!! I, too, am curious to know how the beadboard wallpaper has held up. I LOVE the rain gutter bookshelves, but this idea especially! This idea would look great in my son’s room. Think I’m going to go for it! You did a great job on the room! Looks great! The gutters are super clever and I love the lampshade. I like how the beadboard wallpaper butted up against the rain gutters makes them look all the more like crown molding. And I love the way the bookshelves run all the way around. Very nice! We did a similar project just yesterday! We thought it was an especially clever way to handle the oversized books that don't fit neatly in the storage cubbies in our son's room. I've been lurking for a while – this is my first post here! We use raingutters in the classroom (I teach junior high English) under the chalkboards to put new books to read so that they are visible to students. I would never have thought to use them at home, but this looks amazing! I think it's an idea for my daughter's room – she LOVES books. Christianne sent me over here to see these amazing shelves! I'm in love! What a fabulous idea. 🙂 I also like your selection of books–we share a lot of the same favorites. I love it all! I am a new follower! I've thought about the rain gutter for books for my boys room too. I am in the process of re-doing their room! You all did a wonderful job! So cute! I just became a follower. I have an almost 5-year-old and have been thinking recently about how to change his room. Wainscotting has been on my mind along with a chair rail, but now you have completely transformed that vision. Rain gutters are an awesome idea! The way the books line your sons' room is so charming. The whole room looks so inviting. Great job! Followed Julia's link over here. Shazamm! Is 54 too old to have a rain-gutter bookshelf in one's bedroom? What a stinkin' fabulous idea. The whole room is a masterpiece. Love the room, it looks great! The Rain gutter Idea is fabulous! WOW, WOW, and WOW! !…it's so much better than the piles of books on my sons train table and on every other horizontal surface he can get to! It's not often that I see something repurposed that makes me gasp, but you have definitely done it. I can't believe those are gutters, or that they look so fabulous on your boys' wall. Wicked, wicked good job. Great job with all that you havce done here!!! Such a beautiful room. Plus that window is fabulous too! The gutter idea is awesome! I am also totally in love with the brick and windows you have! Great space! That is too cute and very original! I love your lamp shade, the gutter shelf and the wallpaper. Where do you get that paper and how much is it? It would be perfect for my daughter's room, however we are on a very tight budget. I LOVE the idea with the rain gutters. It looks awesome. I am visiting you today for the first time and you are awesome! I love the idea of the rain gutter book shelves. The bedroom is just perfect! I can't wait to see what else you come up with. That is a crazy good room! I have seen rain gutter bookshelves before. Reading expert Jim Trealease is a big advocate of them, but I have never seen them look stylish! AMazing! So glad I found your blog! 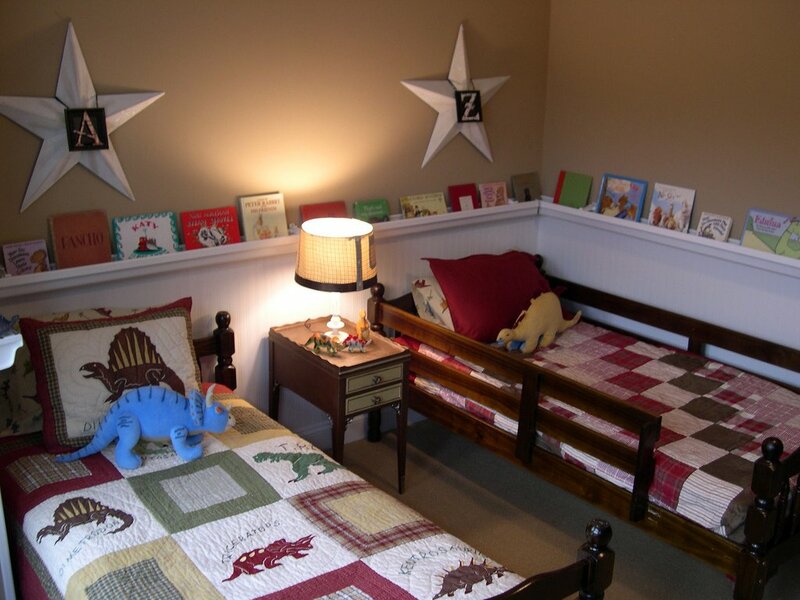 Your boys' room is absolutely adorable . . . and smart! I love that your boys are surrounded by books! Beth, I'm SO glad you added this one to the party. Oh man, that is so cute, you did an awesome job & I think the rain gutters are making me drop my jaw much more than the beadboard. 🙂 What a fantastic idea that is for a kid's room. I think I may do a recap of my party and highlight everyone's projects, maybe next week. This one is super fantastic! So glad you added it. I loved the look of your boys' room! It's great! How fun to have books at their fingertips! Beautiful job! Now that's something I never imagines rain gutters being used for. Wow is that clever. Great idea!! I love this! I am so going to try the rain gutter idea for the boys' next room…. The entire room looks awesome. I love everything you & DH have done. Thanks for sharing. I'm bookmarking it to come back to for ideas in our new home. What an awesome room!! I love it!! What lucky little boys! You and your hubby did an amazing job, and I hope your family enjoys many happy hours reading together in there. Beautiful! I love the rain gutters-what a great idea. Wonder if I could talk my husband into that? Now that is thinking outside the box. Gutter book shelves. Who would have ever thought? Well obviously you!!! The room looks fabulous. You guys did a great job. I love the gutter shelf. I think that would look great on top of board & batten too. Thanks for showing us your adorable room! That's such a great idea for showcasing books! I'm tempted to try it out myself. Thanks for the post and congrats on a wonderful job on your boys' room! Their room looks great. I popped over from Kimba's DIY day. I love your creativity with the rain gutters. The lampshade with the old men's shirt is very cool as well. Nice job! OH WOWZA!!! Gorgeous bedroom!! ANd what a clever idea! That turned out amazing!!! Rain gutters? You clever lady ;)How was the wainscoting wallpaper to work with? What's the texture like? I have been trying to convince hubs on it for a month or two. It looks awesome!! Their room is terrific!! Can you come help me? What a smart idea! Very cute room. This room is absolutely amazing! 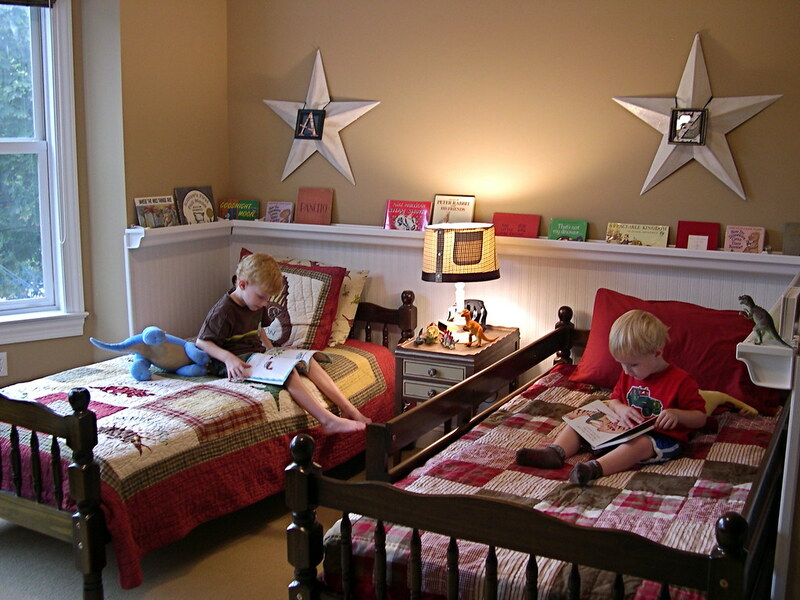 And I kid you not, the photo of A on his bed reading looks like it came straight out of the Pottery Barn catalog. I LOVE the rain gutter bookshelves! And your boy's room looks amazing! The brick, the dinosaurs, even the lampshade – it's all so boyie! I told my honey when he gets home (he works offshore) – putting some up in Serenity's room is on the TOP of his to-do list! The rain gutters are ingenious!!! The exposed brick in the room is simply divine!!! Looks great. I put some up in my craft room and posted about it a few posts back. Isn't it amazing how much it looks like the real thing. Your boy's room is adorable! Love the books propped on the gutter. NO way!!! LOVE it!! So perfectly cozy. Rain gutters! Get out! They looks really cute with the books tucked inside. And I love the exposed brick wall. Really neat room. i love rain gutter bookshelves and these look awesome!! the whole room turned out fabulous. and exposed brick???? omyword. that is unbelievable. love it all!!! That looks so nice. I love the fake beadboard and that the books are accessible via the rain gutters. Good job putting it all together on a budget! Beautiful room! I love the bookhelves! I've been thinking about doing this in my daughters room and now it will be one of my next projects! What a great blog! Beth, I am loving this! You can't even tell that they're rain gutters. Makes the books so accessible and I'm sure it will encourage your kids to read. Love that! I must admit, that is THE BEST idea I have ever seen. What perfect bookshelving taking so little space and so convenient for the boys. The room looks just great! that turned out great! i'm so in love with the paper & the rain gutter bookshelves. The room looks great ! It looks like a wonderfully livable place to read, sleep, meditate, pray, think, love one another as brothers and friends. You did a FABULOUS job, Beth! It's not too cutesy and will grow with the boys very well. Congratulations on a successful transformation! Looks amazing – looks like the boys love it too! Amazing – thank you for the inspiration! Fabulous! I have so enjoyed all your posts about all the little elements of this room that make it complete. Love the exposed brick! What a cute room. I bet the boys love it. The rain gutter bookshelves look amazing. Thanks for sharing this idea. I might have to use it. PS. I am already a follower…Love you! I am NOT kidding you when I say this room could be in a catalog. I LOVE how it turned out! What a vision, lady! It's spectacular! This is one awesome room! I know you and your boys are thrilled. The beadboard walls, bookshelf, and stars just look so great together. And, YES, I love that exposed brick and am so jealous of it! LOVE, LOVE, LOVE IT! It turned out so nice. The stars really pull it all together above the beds. I have seen many posts about raingutter shelves, but your blog just makes them…well, the room is simply wonderful. And the most important thing is that it is adorable AND livable! Great job! Can I just tell you that I love your blog? Girl, you have got such mad style. Your boys room looks like it came straight out of a Pottery Barn catalog. I'm loving the quilts on the beds too. You did an amazing job! WONDERFUL IDEA! Coming from a former preschool teacher! The bedroom is beautiful- comfortable, organized and cozy. Perfect for your guys! I am going to be echoing all the earlier comments…love this room. The idea of using gutter for bookshelves was genius! I also love the beadboard wallpaper. The room turned out so cute and I'm sure the boys love it! I love that idea; I will share it with my daughter. Love the whole room –soooooooo cooooool! Beth…I love, love this idea!! Such a good idea to turn clutter, into a cute design. I say clutter because my kid's books are always all over their bedrooms…ugh!! Such a great job. I love the gutter shelves…so neat and such a great way to hold the books. Very, very nice. Like you…I love the bricks. Beth, it all turned out beautiful! Congratulations to bouth of you on a job well done! Beth- this turned out so GREAT! it looks like a page out of Better Homes and Gardens or Martha Stewart! I love the shelves and the bead board look! I also love the brick… so trying not to be super jealous! I am definitely going to try some of those rain gutter shelves! 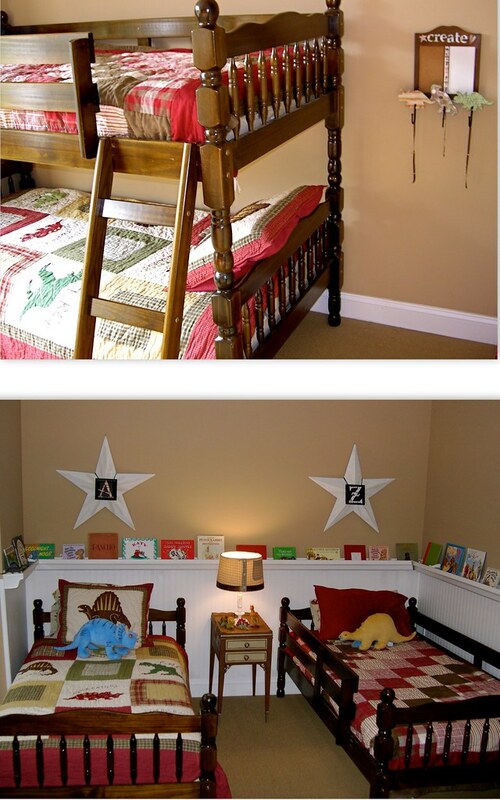 That is the cutest boys room! Love how you used the rain gutter! It is a much better look than border! Gives you so much more room instead of using bookshelves. I guess when you run out of room you could just add another row of gutter and books? What a wonderful transformation! All of your ideas…the end result is terrific! It looks like your boys will enjoy that room for years to come!